…the kind of history he regrets and she wishes she could forget. She was the girl. The only girl. Ever. Nine years have passed since heavy-metal songwriter, Zach, slept with, then walked away from, his best friend, Violet. But that doesn’t change the fact that he’s never gotten over her. Despite the years that have passed, chick-lit novelist, Violet, vividly recalls the pain of Zach's rejection, and hates that she's never been able to completely let go of the brooding boy who turned his back on her. When the rocker and the writer find themselves thrown back together in a strange twist of fate, their chemistry is just as scorching as ever, but old wounds don’t just disappear. Even if Zach can explain why he walked away from Violet, can she find the courage to trust him again? Together they will discover if a love that broke them both is worth a second chance at forever. The first time I saw this book I didn’t know what to expect, well somehow I know it’ll be romance but I wonder what kind of story this is. Well I can say it has a lot of adult stuff in here but then I continue reading because of its story. It is beautiful, full of love and inspiring. I love how the writer made the story. The sequence of the story is good, no hidden story. All of the questions are answered. Though like I said it has a lot of adult-romance stuff in there, I still in enjoy the story flow because it didn’t just focus on making love but the story continues. Zach and Violet’s story is lovely. I envy them. Every time I read Zach’s true feelings for Violet I am thinking of my own Zach in my life, he’s a guitarist too at the same time drummer and he makes songs, enough of that coz the story of my life is different from them – Zach and Violet’s story is perfect. A dream that every woman wants to have. Their story is an inspiration, coz no matter how long they separated fate comes and reunited them and to have a man who loves you forever is a dream come true. I can’t say much about the book, I’m stunned of how beautiful it is. I’m speechless because of their perfect relationship. I enjoyed this book as much as I want to admit it when I started reading it’s hard to stop. The book revolves from them only and nothing more and it’s really straightforward. I just wish there’s more Violet and Smalley’s story I just want to know Violet’s life when she was with the other man and the question from how she end up with Smalley was answered here. "Absence makes the heart go fonder"
I agree to that line though I don’t have plans on doing the ‘absence’ thingy. I’m in love with this book and it is my first ‘read’ book for this year. I’m looking forward to reading other good books out there. 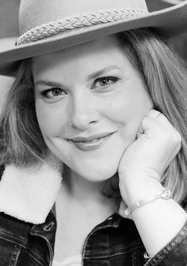 Katy Regnery, winner of the 2013 NECRWA First Kiss and 2013 Maine RWA Everything But the Kitchen Sink contests, has always loved telling a good story and credits her mother with making funny, heartwarming tales come alive throughout her childhood. A lifelong devotee of all romance writing from Edwardian to present-day, it was just a matter of time before Katy tried her hand at writing a love story of her own. As it turned out, one love story turned into a series of five Heart of Montana romances, following the love lives of the Yellowstone-based Lindstrom siblings. In addition to small-town contemporary romance, Katy is presently writing a paranormal romance that takes place in northern New England and the forests north of Quebec. Speaking of forests, Katy lives in the relative-wilds of northern Fairfield County, Connecticut where her writing room looks out at the woods and her husband, two young children and two dogs create just enough cheerful chaos to remind her that the very best love stories of all are the messy and unexpected ones.